She mentions this episode from Evidence Talks about the Right to Disconnect law in France. Oh, man, the book... What Lisette has learned about her writing process. We talk about Trello's aquisition by Atlassian and the comments in Michael Pryor's blog post. Are we getting used to tools being free? Pilar has discovered a new feature in Zoom which could help more people jump on video calls. Listeners: Does it bother you to see yourself on the screen during video calls? Pilar is co-hosting a new podcast. How CEO's can lead the transition from office-based to virtual and encourage people to use tech mindfully. France's new law, the right to disconnect. Do we need legislation to encourage conversation? Have a listen to the More or Less episode: Does Sweden Really Have a Six Hour Day? 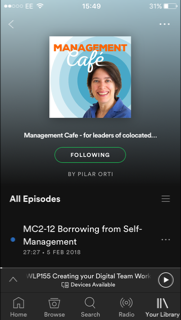 32mins Pilar talks about the PIC framework to help you build a communication infrastructure for a virtual team and how you can cross-check it with self-determination theory of motivation, to make sure you're not dampening intrinsic motivation. When you're designing processes and choosing tools, and role-modelling behaviours , also keep an eye out that you're not squashing any of the three components of intrinsic motivation: autonomy, competence and relatedness.